We read with interest the article by Monteiro et al. (1) reporting that noncommitted peripheral invariant NKT (iNKT) cells could be induced to produce IL-17 when activated in the presence of TGF-β and IL-1β irrespective of CD4 and NK1.1 expression. Our previous papers showed that IL-17–producing iNKT cells acquire their ability to secrete high levels of IL-17 in the thymus (2, 3). These iNKT17 cells are identified by their expression of ROR-γt and are in majority NK1.1neg and CD4neg (2, 3). To get inside the question raised by Graca’s team (1), we took advantage of ROR-γt-GFPTG mice to electronically sort NK1.1pos iNKT splenocytes into ROR-γtneg and ROR-γtpos cells (Fig 1A). Using the same conditions described in Monteiro’s paper, we unexpectedly observed that NK1.1pos ROR-γtpos iNKT cells greatly proliferated (at least 10-fold) while the majority of the ROR-γtneg counterpart failed to expand and survive (Fig. 1B, 1C). This could explain the high frequency of IL-17-producing cells observed by the authors (1) because even low numbers of ROR-γtpos iNKT cells in the beginning of their cultures could consistently proliferate and be the major iNKT cell subset at the end. The NK1.1pos ROR-γtpos iNKT cell fraction expanded and produced higher levels of IL-17 when cultured in pro-Th17 conditions compared with its ROR-γtneg counterpart. 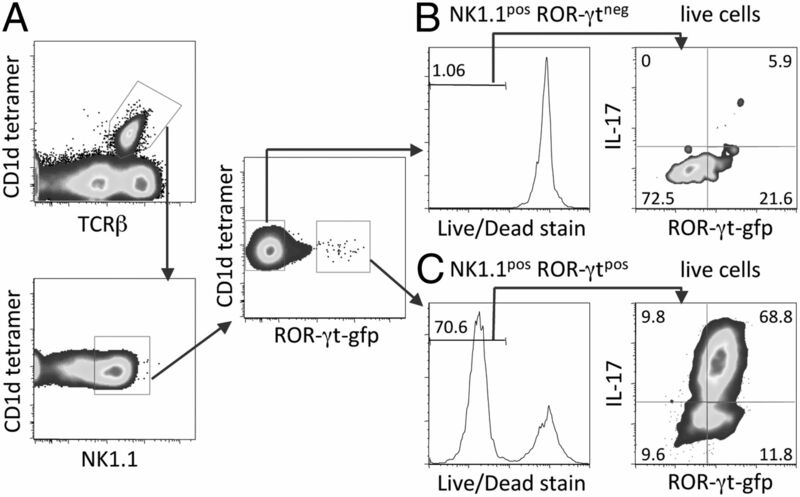 CD1d tetramerpos TCRβpos NK1.1pos iNKT splenocytes from ROR-γt-GFPTG C57BL/6 mice (A) were electronically sorted into NK1.1pos ROR-γtneg (B) or NK1.1pos ROR-γtpos (C) cells and further cultured with plate-bound anti-CD3 and anti-CD28 mAb in the presence of IL-1β, IL-6, anti–IFN-γ, and TGF-β (all from R&D Systems). Four days later, cells were further stimulated for 4 h with PMA + ionomycin and then analyzed for cell viability using Live/Dead (Life Technologies) staining (B, C, left panels). ROR-γt expression and IL-17 production were then assessed among live cells (B, C, right panels). Representative dot plots and histograms (three distinct experiments using a pool of 2–5 mice) are shown. The percentage of the respective subsets is shown. We cannot completely exclude the possibility that a small fraction of ROR-γtneg iNKT splenocytes could acquire ROR-γt expression and become IL-17 producers in periphery upon pro-Th17 conditions (Fig 1B), but, consistent with our previous report (3), our present findings indicate that this is not a general rule for peripheral iNKT cells. We are indebted to National Institutes of Health Tetramer facilities for providing CD1d/PBS57 tetramers and to G. Eberl for ROR-γt-GFP mice. This work was supported by institute funds from Centre National de la Recherche Scientifique, Université René Descartes, Paris V, and the Agence Nationale de la Recherche Mécanismes Intégrés de l'Inflammation iNKT-SAP project to M.C.L.d.M.
. 2013. Induced IL-17-producing invariant NKT cells require activation in presence of TGF-β and IL-1β. J. Immunol. 190: 805–811.
. 2008. Critical role of ROR-γt in a new thymic pathway leading to IL-17-producing invariant NKT cell differentiation. Proc. Natl. Acad. Sci. USA 105: 19845–19850.